The Diesel Page - 1982-2000 GM 6.2L & 6.5L, and 2001 and newer Duramax 6600 (6.6L) GM Chevrolet and GMC Diesel Performance, Upgrades, Fuel Economy, Repair, Service and Maintenance. The Diesel Page is a member-supported web based magazine and enthusiast group, which focuses on all model-years of the General Motors light-truck 6.2L, 6.5L and the Duramax 6600 diesel engines. The Diesel Page has been online since early 1996 - the longest running GM Diesel web site and bulletin board forum on the net. We're here to help you maintain and repair your 6.2, 6.5 or Duramax diesel powered truck, find solutions for diesel fuel injection problems, increase performance, locate the best and least expensive parts sources, repair and upgrade the Chevrolet and GMC light-duty trucks, and we'll help improve your satisfaction in owning a General Motors 6.2L - 6.5L - 6.6L diesel powered light-truck. If your interest is in the Duramax 6600, we have the most comprehensive collection of new GM diesel pickup truck information found anywhere. Our membership program also helps each of us share a common interest and learn from each other. What we know came from a wide variety of sources - including touring the DMAX and GEP (General Engine Products - aka AM General) engine production facilities located in Moraine (DMAX) and Franklin (GEP) Ohio, discussions with diesel mechanics from all across the U.S. and Canada, time spent in local performance engine rebuilding shops, more than two decades of communication with countless other GM diesel owners, and continuous first-hand ownership experience with the 6.2L/6.5L diesel engines since 1986 and the Duramax 6600 since December 2000. This is not a General Motors Corporation web site, nor are we diesel mechanics. In addition to owning a series of GM diesel-equipped pickup trucks and SUVs since 1986, our qualifications come from a broad-based technical training, professional automotive writing and photography experience, and a desire to learn more about the GM diesel engines. This web site does not sell replacement parts or aftermarket performance products for your truck. Instead, we provide the most valuable and unbiased editorial found anywhere for the GM diesel pickups and SUVs. The GM light-truck 6.2L and 6.5L diesel engines were optional in the 1982-2000 C/K series pickup trucks, and in the Suburban, Chevy Tahoe & Blazer, GMC Yukon & Jimmy, vans, and even in Class A motor homes (RV) - in both turbo diesel (TD) and naturally aspirated (NA) versions. In addition, low cost and ready availability have made these engines extremely popular the world over for diesel conversion projects; powering Land Rovers, Land Cruisers, and a host of other foreign and domestic production vehicles. In addition, the Duramax 6600 has proven itself flexible enough to be considered for a variety of repower projects. Designed as a diesel engine from the ground up by the Detroit Diesel Division of General Motors, the original 6.2L diesel engine was introduced in the 1982 model year GMC and Chevy C/K pickup truck and full-size SUV lines. Taking this engine design to the next level in the 1992 model year, the new 6.5L diesel engine was an advancement in technology, and was designed for the application of a turbocharger. The 6.2L saw its final year of production in 1993. While the 6.5 was replaced by the Duramax 6600 beginning in the 2001 model-year Chevy and GMC pickup truck production, the 6.5L diesel engine continues to be manufactured and sold by AM General. AM General was the manufacturer of the civilian H1 Hummer and the current military HMMWV. Support for the 6.2/6.5 will continue to be a big part of The Diesel Page well into the future. The Diesel Page has expanded coverage of GM's diesel engines since the introduction of the Duramax 6600, which is a result of a joint venture between Isuzu and the General Motors Corporation (forming DMAX Ltd.). We'll have all of the latest test reports and event coverage as that information becomes available for the LB7 / LLY / LBZ / LMM / LML Duramax 6600 diesel engines, as well as Allison 1000 series 5-speed & 6-speed automatic transmissions. Our professionally written product coverage and bulletin board discussion forum will have the latest information concerning the Duramax, as well as product reviews covering electronic upgrades such as chips, tuners, and programmers. The following topics cover a wide range of subjects related to the General Motors and AM General 6.2/6.5/6.6 diesel engines. A lot of this information is available free of charge, but we hope you will take advantage of the many benefits a subscribing membership offers, and become a subscriber today using the online security provided by PayPal. Your membership is appreciated, and your support is essential to help keep The Diesel Page on-line. A 1-year membership includes access to all of the technical resource and troubleshooting links found in the Members Area. Thank you for visiting! What's New: November 8, 2018 - See all of the new editions of our 6.2L/6.5L Diesel Book Series. * 2018 marks our 22nd anniversary on the Net! 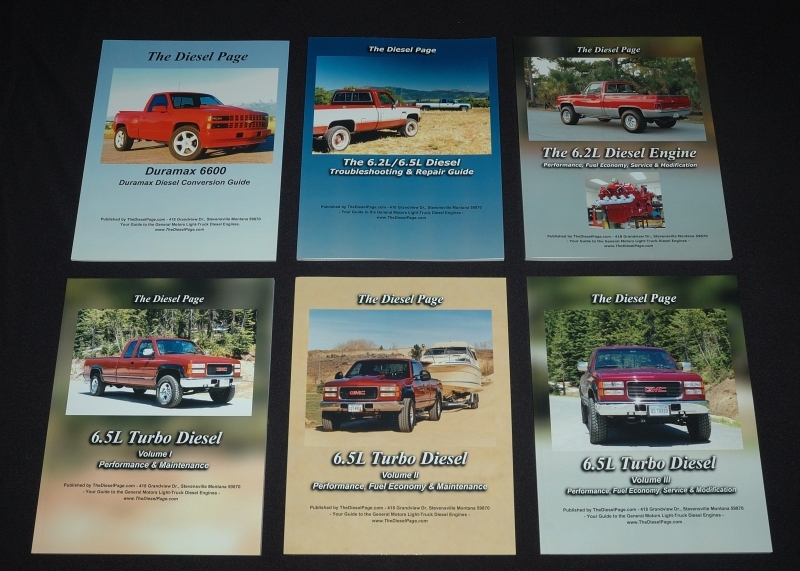 The Diesel Page was the very first diesel pickup community web site - for any brand of diesel pickup. Current Articles: 1998 Chevy LBZ Conversion, War in the Desert, Auto Glass Replacement, 2001+ Headlight Repair, 6.2L/6.5L Tech Tips 2017, Replay from 2007: DirtyMax ProStock Racing, Rust, GM's 2017 6.6L L5P Duramax V-8 Turbo Diesel, Duramax Water Pump Replacement - Part I & Part II, 700R4 Thottle Valve Bracket, Front Hub Bearing Assembly Replacement, Dr. Lee's Perennial Project Truck, 6.5L & Duramax Crankshafts, Diagnostic Trouble Code P0087, 1999-2007 Power Window Regulator Service, Measuring & Fitting 6.5L Diesel Main & Rod Bearings, Measuring & Fitting 6.5L Diesel Pistons, Turbocharger Selection... and so much more! Current Product Reviews: Phaser Dual-Idler 6.5L Gear Drive Timing Set, Banana Pan - Cast Aluminum Oil Pan for the Duramax, MagnaFlow Performance Exhaust System, Automotive CAN OBD2 Code Scanner, Amsoil's Dual By-Pass Oil Filtration System, 2001-2007 2500HD/3500 NVG-261/263 Transfer Case Leak Prevention, ATS Allison Extreme, Custom Programming the LLY, Custom Programming the LB7, and more. Please visit our supporting vendors! New Product Announcements: Edge Evolution CS/CTS, BD Cam Caster Adjustor Kit, Forged-Steel 6.5L Diesel Crankshafts, Licensed Duramax Diesel hats & t-shirts, Oil Centrifuge Filtration Kit, DTech FSD/PMD Replacement, 6.5TD Engine Oil Cooler & line kits, EFI-Live Duramax Programmer, Duramax Diesel hats & t-shirts, Winter vehicle heating products, 6.2/6.5 Injector Socket, Constant pressure clamps, Aftermarket 6.5 Engine Oil Cooler Lines, FSD Extension harnesses and more..
Diesel Economics and Fuel Economy: High fuel prices? Link Exchange: Exchange Links with TheDieselPage.com. Member's Area: Subscriber section for even more content, including technical articles, troubleshooting and community interaction. Membership Application: Secure on-line form!! You can view the table of contents and see what is contained within each volume by clicking the following links. The 6.2L Diesel Engine: Preview - 2018 - Brand new and updated Second Edition - combines the former 6.2L Diesel Volumes I & II into one volume. The Diesel Page welcomes your comments, suggestions or questions. Some of these questions and answers could be included in a future Question & Answer segment appearing either online here in The Diesel Page or in a related industry print or CD publication. Names and e-mail addresses can be with-held at your request. Published E-mail Questions & Answers reflect the opinions of the authors, and we reserve the right to edit letters for clarity, brevity or for other purposes. Your messages are important, and each one will be read. If you did not receive a reply, please check your return e-mail address and try again. Please be patient, and always include your name and correct e-mail address in the body of the message. The images and text contained in this and all other associated web pages of The Diesel Page® are protected by Copyright © 1996-2019 by The Diesel Page®. Copying images and/or text (in part or in whole) from The Diesel Page®, then reproducing this material for others, or posting this material on another web site or Internet forum without prior consent violates US and International copyright laws. Members may print or produce a single copy of any of this information for their own individual use as long as all copyright notices, web URL links and author credits remain intact. Any commercial use, reproducing this material for others, or posting this material to another web site or Internet forum (in part or in whole) is not allowed unless you have prior consent from The Diesel Page®. Violators will be taken to task for illegally using our material. We take copyright laws and individual rights seriously. Only original text and images, or (on rare occasion) re-printed with permission material appears on this web site. We respect the rights and hard work of others. Please respect ours.